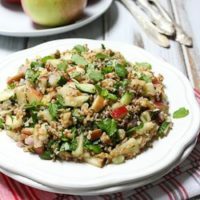 This tabbouleh with apples and walnuts recipe is a new and delicious twist on the traditional Middle Eastern bulgur salad. 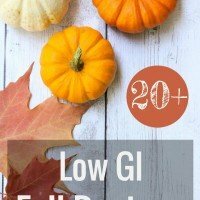 It’s very easy to make and chock-full of awesome nutrients. Tabbouleh salad is a very popular Middle Eastern dish traditionally made with olive oil, tomatoes, onion, and herbs. 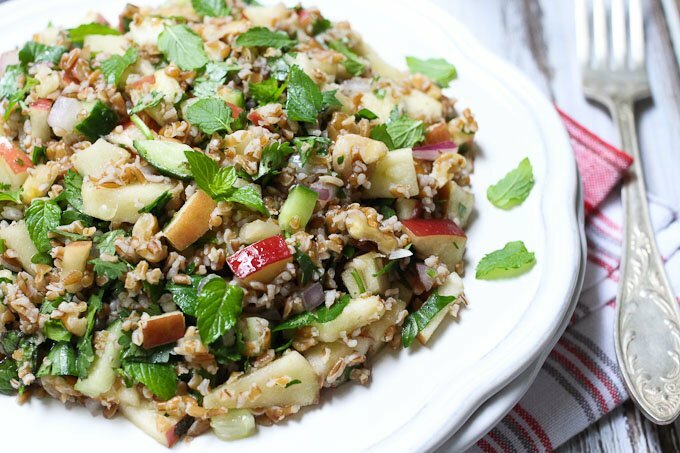 Bulgur is also often added making this salad more filling. 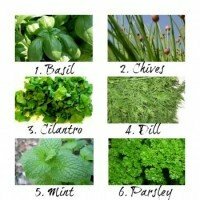 This salad is a wonderful way to include more fresh herbs in your diet. Herbs are incredibly good for you, but it can be hard to incorporate them into your daily meals because they might not work very well with some dishes due to their strong flavor. 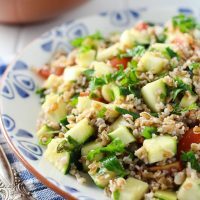 Try tabbouleh salad and you won’t even know that you ate so much fresh herbs. I decided to add some apples to the dish. First of all, it’s apple season and we are swimming in apples here. 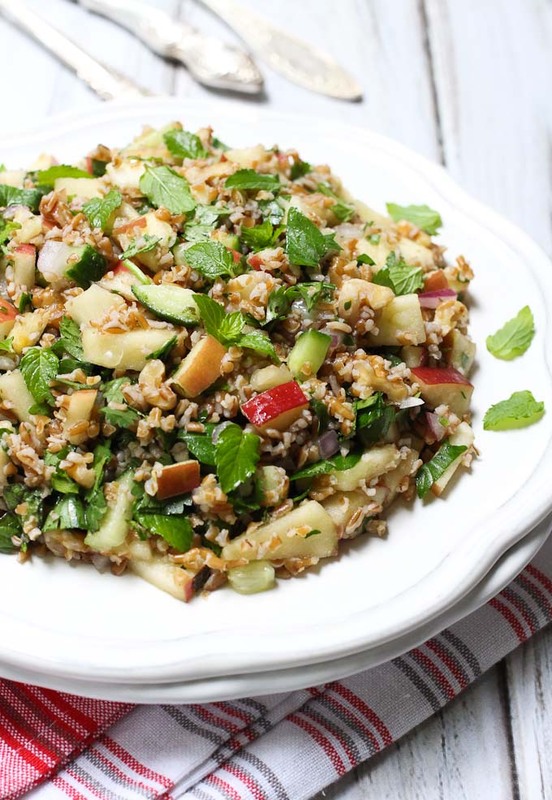 Apples also add a bit of sweetness to the salad which works perfectly. To make this dish even more balanced and to give it some crunch, I added chopped walnuts. 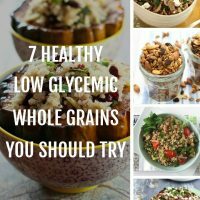 Here we go, another healthy low glycemic dish full of flavor and awesome nutrients! 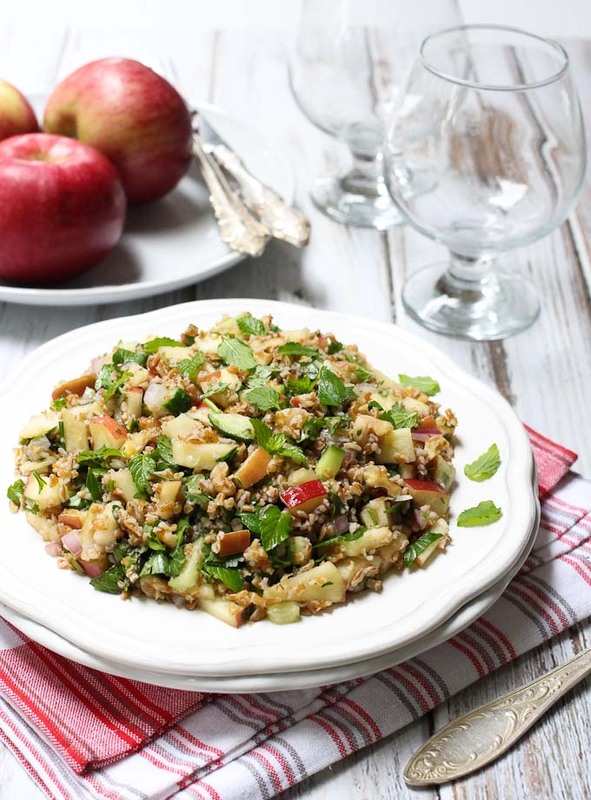 This Tabbouleh with Apples and Walnuts recipe is a new twist on the traditional Middle Eastern bulgur salad made with olive oil, tomatoes, and herbs. Full of flavor and awesome nutrients! In the meantime, chop the cucumber, onion, herbs and walnuts. Dice the apples last and immediately pour lime juice over the apples making sure all apple pieces are covered in lime juice. This will prevent the apples from turning brown. 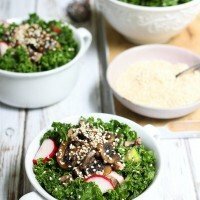 Place everything in a large salad bowl and set aside. Drain off any excess water from the bulgur and add to the veggies. Add the balsamic vinegar and olive oil and toss to combine. This was rigorously tested on healthy food loving flavor hungry taste buds. Ha-ha! In fact, maybe you don’t know, but I have been testing my recipes on your taste buds for a while know. Hope you don’t mind!